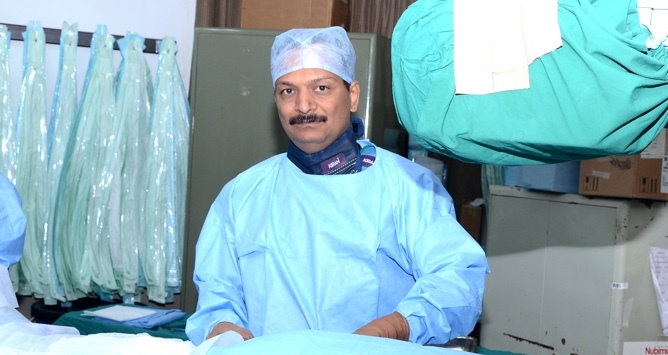 Dr. Alkesh Jain is an Interventional Cardiologist based in Indore, practising for the last twelve years, since 2005. He is currently Director and Cath Lab Head in the Department of Interventional Cardiology at Gokuldas Hospital in Indore. Dr. Jain is experienced in all types of Cardiac Interventions such as Angiography (Femoral and Radial), Angioplasty, Pacemaker Implantation,renal angioplasty etc.Till now he has performed approximately 20000 angiographies and 5000 angioplasties. 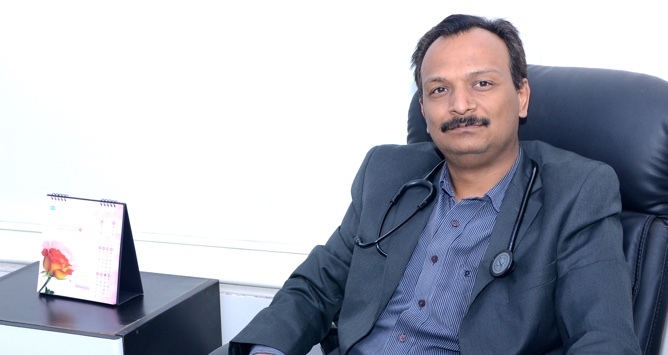 Dr. Alkesh Jain did his graduate and postgraduate medical studies (MBBS and MD) from MGM Medical College, Indore, in 1996 and 1999 respectively. He followed this up with a DM (Cardiology) superspeciality degree from Sanjay Gandhi Postgraduate Institute of Medical Sciences, Lucknow, in 2004. During his internship and residency years, and prior to his current posting, Dr. Alkesh Jain has worked at several institutions and hospitals around the country, such as Batra Heart Institute (New Delhi), MGM Medical College (Indore), SGPIMS (Lucknow), Escorts Arneja Heart Institute (Nagpur), and Choithram Hospital and Research Centre (Indore). Apart from his post at Gokuldas Hospital, Dr. Alkesh Jain has his private clinic in Indore (near Saket Nagar Square), and is a Visiting Consultant Cardiologist at Greater Kailash Hospital (near palasia square). Prevalence of HIV in Patients with Skin and Venereal Diseases. Submitted as Thesis for M D Medicine to Devi Ahilya Vishwavidyalaya, Indore. Assessment of Right Ventricular Function in Rheumatic Mitral Stenosis by Myocardial Performance Index: Correlates and Changes Following BMV. Submitted as Research Project for DM Cardiology at SGPGIMS, Lucknow. A Study on Prevalence of Elevated Lipoprotein (a) and Homocysteine in Normolipidemic vs. Hyperlipidemic Patients. Submitted as Research Project for DM Cardiology at SGPGIMS, Lucknow. Prevention of Atherosclerosis Progression Using Atorvastatin in Normolipidemic Coronary Artery Disease Patients - A Controlled Randomized Trial. Anand Shukla, Mukesh K Sharma, Alkesh Jain, Pravin K Goel. Indian Heart Journal. 2005;57:675-680. Tenecteplase in the Treatment of Acute Pulmonary Thrombo-embolism. J S Bhuvaneswaran, Rajendra Kumar Premchand, S S Iyengar, Rajeev Khare, C B Chabra, T N C Padmanabhan, S K Sharma, Alkesh Jain, S A Pandian, S Rajdev, N Modi, V Kumar. J Thromb Thrombolysis. Online publication 23 Oct 2010. Aortoarteritis: A Clinico-Angiographic Profile. 53rd Annual Conference of Cardiological Society of India. Kolkata, 2003. Does Gender Bias Truly Exist in Patients Undergoing Angioplasty? 53rd Annual Conference of Cardiological Society of India. Kolkata, 2003. Angioplasty Using Long Drug Eluting Stents (> 30 mm): An Institutional Experience. 54th Annual Conference of Cardiological Society of India. Bangalore, 2004. Coronary Angioplasty Using Overlapping Drug Eluting Stents in Long Lesions. 54th Annual Conference of Cardiological Society of India. Bangalore, 2004. A Study on Prevalence of Elevated Lipoprotein (a) and Homocysteine in Normolipidemic vs Hyperlipidemic Patients. 54th Annual Conference of Cardiological Society of India. Bangalore, 2004. Does ACE Gene Polymorphism Play a Role in Indian Patients of Coronary Artery Disease? 54th Annual Conference of Cardiological Society of India. Bangalore, 2004. Assessment of Right Ventricular Function in Rheumatic Mitral Stenosis by Myocardial Performance Index: Correlates and Changes following BMV. 54th Annual Conference of Cardiological Society of India. Bangalore, 2004. Small Vessel Stenting: Small is Safe and Sound. 54th Annual Conference of Cardiological Society of India. Bangalore, 2004. Correlation of Lipoprotein(a) with Extent and Severity of Angiographically Proven CAD In North Indian Subjects. 54th Annual Conference of Cardiological Society of India. Bangalore, 2004. Risk Factor Profile in Indian Females with Angiographically Proven Coronary Artery Disease. 54th Annual Conference of Cardiological Society of India. Bangalore, 2004. Levels of Anti-oxidants in Patients of Recent Myocardial Infarction. 54th Annual Conference of Cardiological Society of India. Bangalore, 2004. Predictors of Poor Outcome in Infective Endocarditis. 54th Annual Conference of Cardiological Society of India. Bangalore, 2004. Teaching Experience: Assistant Professor in Cardiology (Head of Dept of Paediatric Cardiology). Nizam’s Institute of Medical Sciences, Hyderabad. Jan-Jul 2005. © 2018, Dr. Alkesh Jain.